Simply put, the Ozernaya is hailed as one of Kamchatak’s greatest trout fisheries. 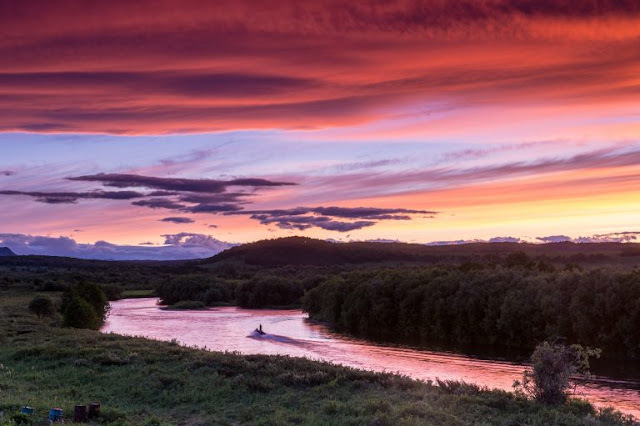 A broad and shallow river reminiscent of the Henry’s Fork, the Ozernaya is home to incredible populations of rainbows in the 20 to 27 inch class, trophy grayling, kundzha, Dolly Varden and coho. No matter when you visit this river, all you will need is a solid 7-weight, a floating line, a fistful of mice and sculpin and a strong fish-fighting arm! Anglers sleep streamside in simple, comfortable, two-person A-frame cabins complete with built-in padded cots, light and heat. The camp features a classic Russian banya (hot shower tent) and a main dining tent where hearty meals, beer and vodka are served each evening. Anglers will access more than thirty miles of pristine water with the aid of aluminum jet boats and skilled American and Russian guides. All fishing is done while wading and there are a number of interesting walk-and-wade tributaries awaiting adventuresome anglers. For those who want to experience the ultimate combination of high catch rates, large and unsophisticated rainbows, and true Russian wilderness, this is the ultimate trip.